You can, for a moment, forget all those hipster beats and neo vintage jams. We present you a mixtape (or album in disguise) by the black ghoul himself, Sir. Aleister X. Phantom beats, ghostly chants and tribute songs to the darkest corners and alleyways straight from New York City via Brixton via Kingston. Get this in your thick black skull, The Black Skull Music Mixtape is a 29 song, tune and skit collection produced by Aleister X for Sonny Midnite Music with executive production by Andrew W.K. and the Steev Mike label. It really is quite the ride and it's up there, sky high with the 2011 Playmaker favorites! Black Friday never felt so right, never felt as haunted. With appearances by Neil Hamburger, Matt Sweeney, David Tibet and many more you are being led into the dark by Aleister X to get smoked out, Midi-sheeeeeitted and creep walked in what might be the ghouliest mixtape thusfar. Free download! This is one of THE ALBUMS OF 2011 for the Playmaker Group. Yes. Honestly and truthfully, a truly beautiful piece of work we are almost out of words. 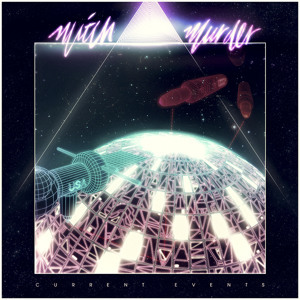 It is the highly exceeding sophomore album from Mitch Murder called 'Current Events' on Rosso Corsa, which is almost outshining the already amazing first album he did. But that is not the only thing. There is certain aggression in the album as well, some faster paced songs. Still they never take away any of the warmth and care of it's total package. Obviously influenced by the likes of soundtrack maestros like Vince DiCola and such, the new album presents itself as a true program of timeless music scoring like media flashes of dreamscape music. 'Current Events' has a red thread of voice samples from news flashes, aerobics, commercials, games, sport reports and the Rosso Corsa trademark of fast sports cars and race sounds. This "soundtrack", this "score", or simply, this music album is an exceeding, contemporary vision of a certain era that hasn't been forgotten by a long shot. We highlight one of the most outstanding, heartfelt songs on 'Current Events' called Telefuture Theme. The album is available here on iTunes. Some of you might know the name Fatima Al Qadiri AKA Ayshay, from the 'Muslim Trance Minimix' she did last year. But now, the Senegal born, Kuwait raised, Brooklyn based multi-media artist hits us with a collection of wide ranging tunes on her debut EP 'Genre-Specific Xperience'. On this debut EP for Uno Records, it surely isn't all Muslim trance... It goes even further than that as all 5 songs range from a wide variety of genres, redefining the word 'genre' on itself with influences from Gregorian trance via Hip Hop to Juke stuff.